UN Security Council condemns the use of chlorine in Syria, threatens measures if chemicals are used in future attacks. 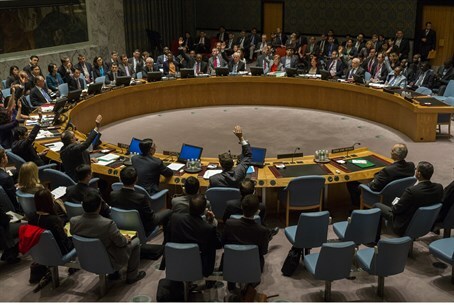 The UN Security Council on Friday adopted a resolution, drafted by the United States, condemning the use of chlorine in Syria and threatening measures if chemicals are used in future attacks. The resolution was approved by 14 of the 15 council members including Russia, Syria's ally, but Venezuela abstained, the AFP news agency reported. "Today this council makes crystal clear that the use of chlorine as a chemical weapon is no less an evil than the use of any other chemical as a weapon," U.S. Ambassador Samantha Power told the council. While the measure does not single out the Damascus regime over the use of chlorine, Western powers have made clear that the evidence points to attacks being carried out by President Bashar Al-Assad's forces. Venezuela's Ambassador Rafael Ramirez said his country would not support the resolution as no blame was assigned over the use of chlorine in reports by the Organization for the Prohibition of Chemical Weapons (OPCW). "An investigation should first be concluded in order to determine the responsibility of those who perpetrated such an abominable act," said Ramirez, according to AFP. The resolution states that the Security Council "decides in the event of future non-compliance... to impose measures under chapter 7" of the UN charter, which provides for sanctions and possibly military force. The measure "condemns in the strongest terms any use of any toxic chemical, such as chlorine, as a weapon in the Syrian Arab Republic." Activists in Syria have claimed several times over the past year that there have been chlorine gas attacks in the country, prompting the United Nations Security Council to call for an investigation into the alleged use of chlorine. In January, an OPCW report said chemical weapons investigators had concluded "with a high degree of confidence" that chlorine gas was used as a weapon against three opposition-controlled villages in Syria last year. U.S. Secretary of State John Kerry has warned the Bashar Al-Assad regime it would be held to account for using chlorine gas against civilians. least 13 people died in the attacks that were carried out from April to August, according to the January report. While the OPCW did not attribute responsibility for the chlorine attacks, it cited 32 witnesses who saw or heard the sound of helicopters as bombs struck and 29 who smelled chlorine. Only the Syrian regime has helicopters. "Despite having acceded to the Chemical Weapons Convention, the Assad regime has again demonstrated its brutality by turning to chlorine as another barbaric weapon in its arsenal against the Syrian people," Power told the council during Friday’s discussion.